I have watched this project take shape for years, and so it was a real pleasure to see the groundbreaking for the Shops and Lofts at 47 finally take place. The project will feature 96 rental apartments, 14,000 sq. ft. of neighborhood retail and a 41,000 sq. ft. Walmart Neighborhood Market. And it is not an understatement to say that it was no easy feat to get this far. The fact that this project took seven years to get to groundbreaking speaks volumes, not only about the tenacity of all of the stakeholders, but also about the fragility of investment in challenging urban environments. From the local CDC’s Executive Director to the developer – everyone committed above and beyond what would have been necessary for nearly any other regular deal. 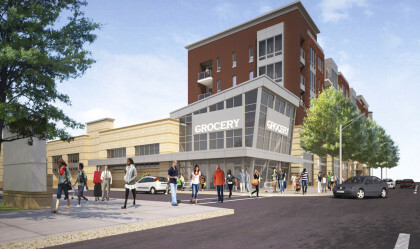 This project, the first the neighborhood has seen in 50 years, is now under construction and will ultimately transform a blighted corner of Chicago’s historic Bronzeville community and contribute to commercial revitalization efforts. I am familiar with the project because in 2007 I was Director of LISC’s national commercial technical assistance program. That year I went to the International Council of Shopping Center’s (ICSC) Las Vegas Dealmaking for the first time to tag along as QCDC Executive Director Bernita Johnson-Gabriel and then Director of Programs at LISC Chicago, Joel Bookman, toured the floor and met with Frank Petroziello and Adam Troy of Mahogany Ventures, the project’s developers. In the years following that introduction, I have kept in touch with Petroziello at ICSC events and marveled as he and his team, together with Johnson-Gabriel and the folks at LISC, kept the project alive. As an outside but interested observer who has watched this project slowly unfold, here is some insight on the critical ingredients that made this project work. Expert guidance. Early on in the process, LISC funded development consultant Chinwe Onyeagoro to support Johnson-Gabriel in her first foray to ICSC. LISC and others credits this early investment in expert guidance as being one of the most critical early investments made in the project. A committed development partner. Finding a partner was not easy. Johnson-Gabriel and Onyeagoro attended ICSC Dealmaking in Las Vegas in their early efforts to find a development partner. ICSC Dealmaking is not for the unprepared. Onyeagoro played a critical role in preparing Johnson-Gabriel to walk the floor. And while most developers shied away from the idea of developing in an untested market, one developer engaged in a conversation that eventually turned into a productive partnership. That was all they needed. Develop and use neighborhood-based market data. Johnson-Gabriel and Onyeagoro went to ICSC armed with a market analysis by LISC’s MetroEdge research unit. The data showed that nearly half of Bronzeville residents had incomes above the city’s median, yet a majority shopped elsewhere for lack of decent local stores. This information didn’t get everyone to reconsider, but it did help open the door to meetings and conversations. It was a good “ice-breaker” that helped set the tone of the conversation and establish Johnson-Gabriel and Onyeagoro’s credibility. Consistent leadership. I can’t say this enough, staff turnover kills projects. In many communities, high turnover undermines consistent, productive steps in the right direction. When there is staff turnover, details need to be relearned, relationships need to be rebuilt, and many projects, particular those in challenging urban environments, can’t withstand these interruptions. The fact that Johnson-Gabriel remained tenacious and focused was, I’m sure, a tremendous asset to this project. Early “booster” shots. QCDC was one of LISC Chicago’s New Communities Program participants (NCP). The NCP program provided seed grants and large scale program investments, and also included the critical early funding for market analysis, as well as things like “street to sidewalk” cleanup patrols and programs that brought art students to design street furniture and banners. These modest improvements were all part of what helped “set the stage” for a more ‘retail-ready’ community. Don’t get put off by “no”. When Johnson-Gabriel attended ICSC for the first time, most developers weren’t interested. Most made it clear that the challenge of urban real estate development was not worth the risk. But the team kept up with their meetings, eventually connecting with Ohio-based partnership called Mahogany Ventures. The rest, as they say, is history. Find an anchor tenant. In my conversations with the developer in 2009, it was clear that financing could not advance until an anchor tenant could be found. But courting an anchor tenant, particularly during the recession, took awhile. Political will. Many retailers got cold feed during the recession, but when Mayor Rahm Emanuel vowed in his 2010 campaign to eliminate all the city’s food deserts, that helped open the door to discussions with Walmart Neighborhood Center and ultimately a signed lease commitment. Make a plan, and then follow it. The geographic, laser-like focus on this intersection was no accident. Early on in the process, LISC funded community-led “Quality of Life” plans. In the case of Cottage Grove, the plan listed the 47th Street intersection as the prime opportunity site. Piecing together the parcels was no easy task, but the mission and vision to transform this intersection was clearly delineated in the community plan, which in turn helped reinforce the decision to deploy the staff resources necessary to keep the project going. Cultivate city partnerships. The project could not have proceeded without a city land acquisition at 47th and Cottage. The City eventually bought 23 vacant lots to create the assemblage. Stay creative. While finding an anchor tenant was critical to securing financing, the fact that the Chicago Housing Authority agreed to lease long-term 28 of the apartments was yet another factor in making the project a reality. Catalytic real estate development in challenging urban communities is the hardest kind to get off the ground. With no other comparable projects, developers are often extremely reluctant to take these kinds of projects on. That’s because they are keenly aware of the fact that securing financing will be challenging if not impossible. That is why partnerships are so critical, from community partners like QCDC, to non-profit funders, to City support, to developers with expertise and stick-to-itiveness, every partner is critical to the process of turning dreams in reality.